This year has seen a staggering consolidation within the semiconductor industry. With deals ranging from the merger of NXP and Freescale through Broadcom and Avago to Qualcomm and CSR, Infineon and International Rectifier and Intel absorbing Altera (which completed today), the field of suppliers in the embedded industry will change significantly by the end of next year as a result. Other deals are continuing, with Dialog Semiconductor's acquisition of Atmel still in play, and TDK taking over Micronas. This is highlighted in the recent figures from market researcher IC Insight. Bill McClean sees the integrated device makers (IDM) overtaking the fabless chip makers briefly, partly as a result of the mergers and partly from currency fluctuations. But it does shake up the list of the top suppliers considerably. As shown in Figure 1, only three of the top-10 IDM semiconductor suppliers are forecast to register growth in 2015 and, in total, the top-10 IDMs are expected to display flat growth this year. says McClean. Intel remains the dominant player, and Altera's $460m fabless business will barely make a bump in the figures as the new Programmable Solutions division. The combined NXP/Freescale is now moving up to challenge Texas Instruments, although the majority of the NXP basis is moving to fabless rather than IDM. 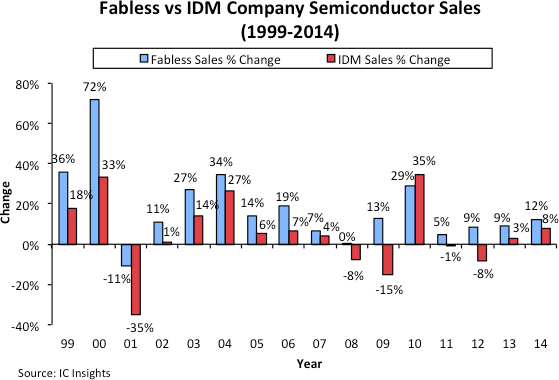 Although flat growth by the top-10 IDMs would typically be considered poor performance, it is still forecast to be a much better result than is expected from the top-10 fabless semiconductor suppliers (Figure 2). In order to make direct comparisons for year-over-year growth, IC Insights combined the merged, or soon to be merged, companies’ 2014 and 2015 semiconductor sales regardless of when the merger occurred, providing a more accurate figure. However, how well the companies execute on the merger will impact on this potential growth. As shown, the top-10 fabless semiconductor suppliers are forecast to register a 5% decline in sales this year, five points worse than the top-10 IDMs. It should be noted that essentially all of the decline expected for the top-10 fabless suppliers in 2015 could be attributed to the forecasted decline in Qualcomm/CSR’s sales this year, which comes from Samsung’s increasing use of its internally developed Exynos application processor in its smartphones instead of the application processors it had previously sourced from Qualcomm. All this highlights the turn in the market in figure 3. From positive growth last year to flat sales this year, the market is heading into its downward trend. This will make life difficult for embedded developers as the top ten companies in both areas cut costs and product lines to compensate, and drive more consolidation through 2016.